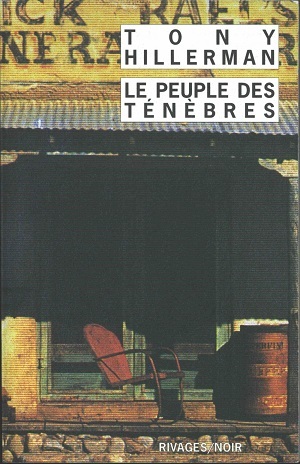 This is the French paperback edition of People of Darkness, the fourth book in Hillerman's Navajo mystery series and the first novel featuring the protagonist Sergeant Jim Chee of the Navajo Tribal Police. This edition was published by Rivages/Noir in Paris, France as a pocket edition, which means the size of the book is smaller than regular editions. The text was translated into French by Danièle and Pierre Bondil. The cover photo is credited to D.R. Binding: Paper covers with full color illustration. The author's name, title and publisher are printed vertically on the spine.